Biosphere 2 is off Highway 77 in Oracle, AZ. It is 25 miles north of central Tucson, AZ and 9 miles past the Highway 79/77 intersection. You will pass the Robson Resort Community of SaddleBrooke Ranch along the way. Construction of the Biosphere 2 facility began in 1986. Biosphere 2 launched its 1st research mission in 1991. That first mission lasted 2 years and ending in 1993. A shorter second mission took place during 1993 and 1994. These well publicized programs provided useful research on our ecological environment. The men and women involved published accounts of these missions. Their views present unique perspectives on the activities and results of the experiments. In 1994, Decisions Investments Corporation assumed control of the property. As part of that action, Columbia University managed the facility from 1996-2003. To take on new the research studies the facility expanded and reconfigured. In June 2007, CDO Ranching bought the Biosphere 2 facility. They then leased the Biosphere 2 properties to the University of Arizona from 2007-2011. In July 2011, the University of Arizona assumed ownership of Biosphere 2. A gift from the Philecology Foundation help fund Biosphere 2 operations. And National Science Foundation grants supported key research activities. The Biosphere 2 facility supports the research of University of Arizona scientists. Biosphere 2 is an important resource for large scale projects. Many of the key experiments focus on global climate change. Finding Biosphere 2 from downtown Tucson is easy. Take Oracle Road north towards Oracle AZ (about 40 minutes). Roughly 2 miles after passing SaddleBrooke Ranch turn East (right) at the Biosphere 2 sign. For more information visit the University Of Arizona website for Biosphere 2. 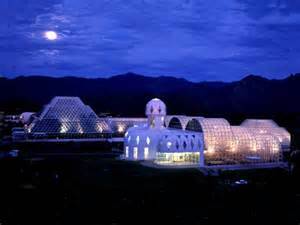 Biosphere 2 is just one of the many attractions in and around Tucson AZ. Others include Arizona Sonora Desert Museum, Pima Air And Space Museum and Kartchner Caverns. If you are considering the Tucson AZ area as a place to live or a future place to retire, we can help.